A lack of largermarkets and social and geographic isolation has led marginal farmers in the dryland regions of rural India to rely on village traders and to sell their marketable surplus. The arbitrariness of such localized relationships has in many cases kept farmers poor, as these petty traders often entrap farmers in a vicious debt circle and offer exploitatively low prices. To address these adversities, commodity aggregation and large-scale marketing of the aggregation has been seen as an alternative method to the status quo. The NGO Samaj Pragati Sahayog (SPS) thus began a Commodity Aggregation Program under the Ram Rahim Pragati Producer Company (RRPPCL) to align members of Self Help Groups (SHGs) with organized markets for the sale of farmers’ harvests. RRPPCL collects these commodities from farmers, stores the produce in warehouses, and transports and sells the aggregation to organized markets when prices turn favorable. RRPPCL is owned by SHGs of women who are also primary producers. These shareholding SHG farmers exclusively qualify to sell their produce to the Company. Further, they stand to receive bonuses if the Company makes a surplus after selling the aggregation to larger markets. The unique advantages of commodity aggregation are manifold. However, to distill it for this post, I will say that RRPPCL and other Producer Companies across the nation give farmers the right to participate in a potentially profitable enterprise and make a surplus they can sustain their families on, instead of being vulnerable to the practices of village traders. In addition, RRPPCL importantly focuses on developing women’s rights to control and management over their own livelihoods. Preliminary data I found indicated that out of the fifteen hundred primary producers who are members of the 121 shareholding SHGs, only around four hundred producers actually sell their harvest to the Company. In other words, the data showed that only 26.67% of Company members who can contribute do. The small base of contributing members threatens the success of the Company, because the larger aggregation the Company receives, the more economical transportation and warehouse costs become, the larger buying markets tapped, and the higher the net profits. The perplexity behind low shareholder involvement must be discovered. Thus, the central research question asks why do most farmers of shareholding SHGs not contribute to RRPPCL? In this regard, what are both the logistical and systemic dilemmas the Company will face moving forward? Finally, in order to increase the bulk of commodities the Company receives, this study attempts to address how it can cater to the concerns of small and marginal farmers. This study was conducted across the Bagli, Kantaphod, and Udainagar regions of the Dewas district in Madhya Pradesh. 192 women farmers from nineteen villages and twenty-one Self-Help Groups (SHGs) were surveyed throughout June and July of 2013. The data of each woman interviewed was gathered for kharif season (monsoon) 2012 and ravi season (winter) 2013, the most recent seasons. The sampling method was a bit complicated, but I will try to simplify it for the purpose of this post. SHGs with RRPPCL shareholders were targeted in each of the three regions. SHGs were selected across diverse geographic regions and with a diverse array of ratios of number of members contributing to the Company to total number of primary producers. What this means is that SHGs with a lot, a medium level, a little, and zero contributing farmers were all interviewed. After the SHGs were chosen, a survey was created in Hindi. Certain questions, such as landholding size, crops grown, quantities sold, prices received, institutions sold to, etc., were asked on an individual basis in a round robin format. After each individual farmer’s responses were recorded, the second half of the survey was conducted as a group. The group was asked why certain members do not sell to the Company, what are the advantages and disadvantages of selling to the Company, what is the maximum period you can wait for payment delivery, etc. The rationale behind asking certain open-ended questions in front of the group was that women of a single SHG had very similar agricultural experiences. Furthermore, because the SHG is a shareholder as a whole, the Producer Company’s success or failure impacts each and every member of the SHG, entitling even the non-farmers to a right of discussion. This study found that RRPPCL should delve into analyzing five primary areas of concern in order to increase shareholder participation: Timeliness of its weighing and collection activities, dependency of marginal farmers on village traders for agricultural inputs, late payment deliveries, low quoted prices and strict quality controls, and distribution of a bonus or not. I have written a lot on each of the areas in a separate report, but I will give you a short synopsis of each topic. Timeliness of Weighing and Collection: In the monsoon 2012 season, the Company directors arrived very late to many villages to weigh and collect the crops, long after the harvest period culminated. For example, the farmers of Satibinda Bachat Samuh in Narsingpura stated that the Company directors came around twenty-five days too late for most of the SHG women. This is problematic because each farmer plants seeds and harvests his crops at staggered times based on his own sense of timeliness. There is no steadfast rule that a farmer must reap her harvest in a specific week. Simultaneously, no farmer wants her collected harvest to lie in her home for an extended period of time, because it can fall victim to mice, rain, and other disturbances. She therefore has a need to sell as quickly as possible, leading each farmer of a village to travel to the bazaar to sell to the trader on different days. This uneven output cycle makes it difficult for the Company to formulate an optimal collection plan. There are some ways to address such a problem. First, the Company needs liaisons in each village to relay information back and forth between each SHG and the Company, so the Company can time its collections properly. This role can be fulfilled by the SHG mitan, the name for the manager of SHG finances, of the village. Second, the Company should have regional collection facilities from where directors can pick up crops at two different times in the season, one relatively earlier and one relatively later. Third, the Company can try to outreach to each SHG and explain the importance of aligning their sowing schedules. It must attempt to convince the shareholders the importance of an effort to converge to a single village-centric sowing time for the greater good of the Company. Agricultural Inputs: Farmers purchased the inputs they are required to buy before the season starts from a nearby trader through one of three methods: cash payment, borrowed the inputs on an outstanding loan account with the trader, or procured them from the government society scheme. Farmers who buy inputs on a loan account are 12% less likely to sell to the Company than farmers who buy with cash. This is either because they owe the trader money right away due to high interest payments and cannot afford to wait for the Company’s paycheck to come in, or they owe the trader actual harvest, i.e. ten quintals of corn. With the Company’s payment times hovering anywhere between eight and twenty days, the natural avenue for the quickest payment was the trader they borrowed from himself, who serves as both a moneylender and crop trader. SPS should consider intervening on the inputs side, a view articulated by an SHG I met with. The women believed SPS’s intervention at this early stage would be most helpful in aiding them to secure a higher surplus at the season’s end. Their own entrepreneurial minds articulated that SPS could buy inputs in bulk, thereby reducing the expense for each farmer. The trader by contrast sells inputs to each individual customer, and thus the collective power of the women at protesting unjustly high input prices is nonexistent. Only a large institution like SPS operating on a scale covering three Federations could reach such necessary economies of scale. By managing the sale of inputs, SPS could target one of the origins of the rural debt cycle, which correlates strongly to whether the farmer sells to the Company or not. Late Payment Delivery: The distribution of payments to the women much later than the harvest was sold to the Company was by far the loudest and most widespread complaint against the Producer Company. Due to the bank’s delays in giving the Company the cash it had loaned, actual payment delivery to the women farmers who had sold their harvest to the Company directors took place many days after the sale had already taken place. The reasons for needing such prompt compensation for the women interviewed were twofold. One, the women often needed to pay back the trader for the agricultural inputs they loaned at the beginning of the season at a steep interest rate, addressed in the preceding section. Two, the farmers had other agriculture-related fees to pay at the end of the harvest season. During the winter season, farmers who grew wheat had to pay their electricity bills, which could be as high as 10,000 Rs. If the farmers do not pay their bills immediately, the electricity department creates havoc by arriving on the farmers’ lands to remove the irrigation pumps. The pattern of late payments has served as “bad press” for the Company, as villagers across different SHGs discuss their disappointment with the Company’s actions amongst each other. To combat such a timing problem, the Company should consider keeping a cash reserve in its accounts for the present season’s payments to the farmers. Instead of having the receipts from the warehouse storing the current season’s aggregation serve as collateral to finance bank loans for the payments of the same season, perhaps the cash leveraged from the preceding season through the bank loans could be used for the current season. Lower Prices and Quality Control: The pricing data gathered indicates that the Company does give, on average, lower prices than the village trader. The 1.845% higher soybean price and 3.186% higher corn price given by the average Udainagar trader over the Company makes a significant difference in the minds of most farmers interviewed. Many farmers complained that the Company’s quality expectations are also too high to meet. This grievance is strongly correlated with the grievance of too low prices. In fact, the study found that it is because the Company has strict quality controls that the majority of farmers receive lower prices. Whereas the Company may give the farmer Rs. 2800 for a low quality quintal of soybean, the trader will give Rs. 3000 for the same quality soybean. He does not differentiate crops by quality and instead mixes varied harvest from each of his customers together. The Company should look into why the seth can afford to give the same price for a range of qualities and to which markets he sells his collected aggregation. It is worth asking if the Company can operate in a similar way, especially because giving higher prices for lower quality harvest directly deals with the social heart of the Company’s purpose. This practice would truly help the farmers who need aid the most secure their livelihoods for the season, especially because low quality harvest is often related to the effects of uncontrollable weather issues. By taking low quality crops for acceptable prices, the Company would in effect be offering insurance against the risk of natural phenomena such as the hailstorm that took place in Winter 2013 or the heavy monsoon season of Monsoon 2012. Bonus: For the past two seasons, the Company was unable to generate enough of a profit to distribute a bonus to the contributing shareholders. The Company had given a bonus in its first year of operation, which in fact generated an expectation of continuity in the minds of many farmers, especially those in areas where they Company was a new presence. In fact, knowledge of both the Company’s purpose and the fact that the SHGs are the owners of the Company is directly correlated to the women’s views on the bonus question. Because the presence of the bonus was one of the most contentious and emotional questions discussed by the women, greater information must be spread to the SHGs who have little knowledge of the Company. If such groundwork is not properly laid as soon as possible, the Company risks losing even more customers due to bad feelings that last permanently. I had a wonderful time conducting research for my report. My topic area interesting dovetailed a study of business with traveling village to village to gather data and have conversations with the women who I think have sometimes been forgotten in the grander operations of the Company. The joy of briefly connecting with over two hundred women by exchanging stories, listening to grievances, sharing laughs, being blown away by their deep insights, and promising each of them that I’d do my small part to try to document their daily struggles was one of the most enriching experiences of my life. I actually had fun writing the report and tabulating data to draw these wider conclusions. I know—nerd alert, but it was awesome to see how my Huntsman degree from Penn could be put to use in a way I find mentally stimulating and soulfully purposeful. 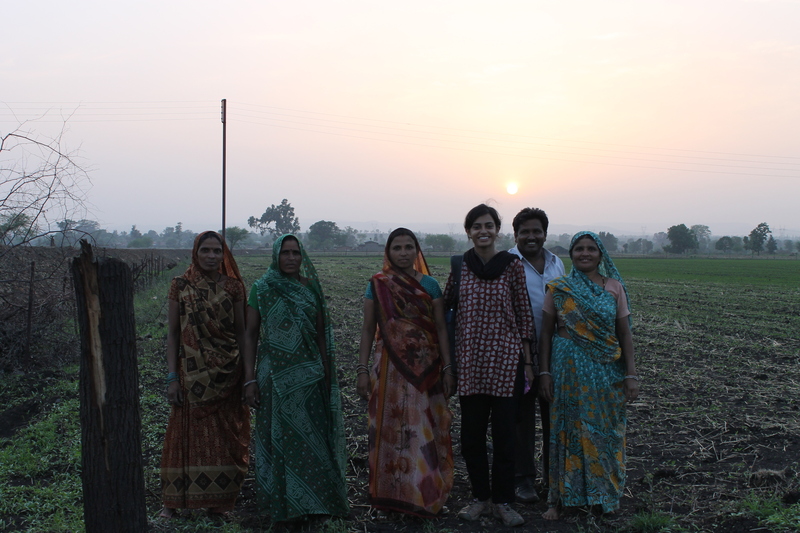 I think interning in rural Madhya Pradesh as an Indian-American can seem like a cop-out to some. Come on, land somewhere exotic where you can truly feel like an outsider! But I feel that my mediocre knowledge of Hindi, preexisting context of rural India, brown face, and fundamentally deep love for this beautiful country allowed me to bond with the women I met and the project I researched at a level a true outsider would take time to develop. All I know is I am going to keep coming back to communities like the ones I spent ten weeks getting a glimpse of, because that is where I feel I belong. If any of you are interested in reading more about my study, I have written a much more detailed, longer report for SPS that I’d be happy to share with anyone. I cannot thank SPS, the women I interviewed, and CASI enough for this summer. Thank you all! Nice work, way to finish strong! Hi! I'm Aashna from the Class of 2016. I'm in the Huntsman Program for International Studies and Business at Penn, for which my Wharton concentration is Finance and my area of focus is South Asia. I had a fabulous experience interning at Samaj Pragati Sahayog in Madhya Pradesh during the Summer of 2013. Currently, I am interning at the Center for American Progress in Washington, DC, where I am working on Housing Policy.